Wow, these jokers have a whole other affiliated website that has even more pirated blog posts. They removed 6 more of mine today....some from this site. I think I can pretty much guarantee that I'm not the only house blogger that has had posts lifted. Take a look at what they did to this poor guy's post. Note their big fat logo hacked at the top and their contact info at the bottom. Here's the thing. I spend a fair amount of time working on my house, documenting it, taking photos and blogging about it. I enjoy writing and it's fun to document the progress on my house. I have given permission to anyone asking to link to my blog....or use a photo. In fact, I have zero problem with anyone within reason linking to my blog as long as they give credit where credit is due. So, you can imagine my disappointment when I discovered an Australian commercial website, using some of my posts.....and taking credit for them. They actually have hijacked a Blogger page (it appears that they cut & pasted my Blogger page, it is not a link)....hacked it to have their logo at the top....removed the Blogger navigation bar, etc.....and made it appear to be coming from their website. Hello....my blog is syndicated....the photos are on a Google server...the comments were posted to my blog....I have the damn doorbell in my house. Here is my original post. There is not even a question here. It appears they have done this to thousands of articles from different sources....making money off of it. Hard to believe. I notified the company yesterday of copyright infringement. Today I politely notified their website designer, Wiliam Web Design, and the isp requesting that my work be removed. I've removed the photos they used from the Google server, but it takes up to 24 hours for them to vanish. On Friday, I start putting the screws on. Happily, the Australian Attorney General has a very convenient website and takes copyright infringement seriously. This company has not begun to see the fury that StuccoHouse can unfurl when ticked. Let's hope they do the right thing before that happens. When I was looking for a house 5 yrs ago, one of my friends knowing I love old houses, drove me down there to take a look. One of the new "old" fill-in houses was for sale. While that house was not for me, the neighborhood was charming. It's a pedestrian mall - with all of the houses facing an inner sidewalk/courtyard. I didn't have a clue this street even existed. If you didn't know it was there, you would totally miss it. Many of the houses were built for mill and railroad workers back in the late 1880s....and saved from demolition in the 1970s. Those lots whose houses couldn't be saved, were filled with new houses in the original style. 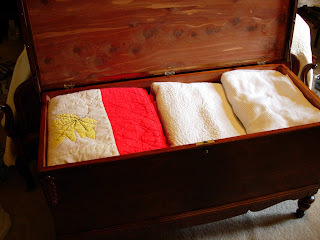 Last month for my birthday, my mom and dad asked me if I would like to have my grandma's cedar chest restored for use in my house. I've used my grandma's 1930's bedroom set for 15 or so years. 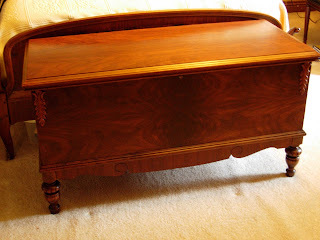 The walnut cedar chest doesn't exactly belong to the rosewood set, but my grandma always used it to store her linens at the foot of the bed. The chest was in pretty bad shape with pieces of veneer missing and deep scratches all across the finish. My answer should be pretty obvious. 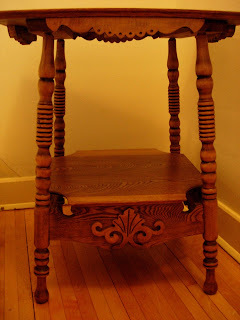 My mom knew of an older gentleman in New Ulm, MN who had originally restored the bed for me many years ago (my mom grew up in and around that area). 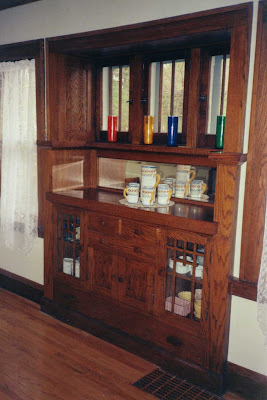 She tracked down his phone number and gave him a call to see if she could coax him out of retirement to work on the cedar chest. He said yes. So a couple of weeks ago, my mom & I drove down to New Ulm to pick up the restored cedar chest. It turned out great. 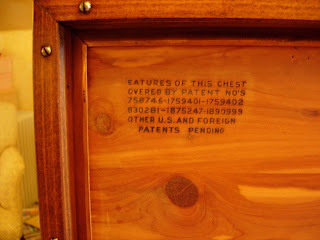 I wish I had though to take a photo of the pre-restored chest. Let's just say the change is pretty dramatic. We also stopped in a local antique store just to take a look at what they had on hand. If you read my blog regularly, you know no good could come of this. Of course, I spotted a great old walnut/maple parlor table that I absolutely could not live without. I've been looking for one for a while now. I suspect it is the German heritage that accounts for the extra carving on the parlor tables you see down there. 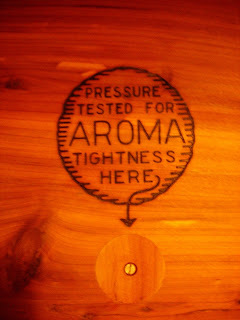 You rarely see that detail of design on these tables in the Twin Cities. This is going to be one of those miscellaneous topic posts that is probably more therapy for me than it is interesting reading for you. First, I talked with the copper drip edge guy this afternoon. Well, we exchanged messages. 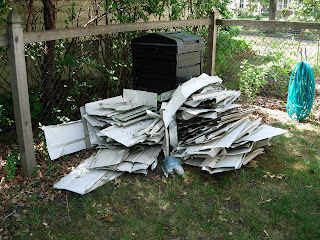 His message said they were a bit backed up in their work due to the monster rain storms we have had here the past week. Their offices are located in a suburb that was particularly hard hit. They are taking care of customers with leaks first. Understandable. I just asked him to give me a day or two notice before they came out to my house....so, I could be here for the install. I am curious what the condition of the roofing underneath the current drip edge is......and I also want to understand how they install it. So, it looks like it will be a week or two before I get to post photos. 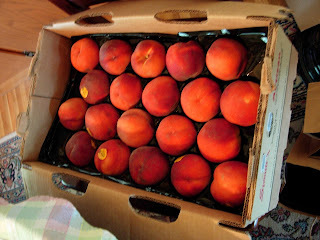 Yesterday, my mom and I canned 40 pounds of peaches. Peeling peaches is a hellish task that only becomes worth it in the middle of winter when you can pull out a jar of peaches. This latest canning session cemented in my mind that I really, really need one of those vintage 1940-1950's stoves. You know, the big monster stoves with all that room on top. I need to start seriously watching Craig's List....figure out what I want....how much I need to pay.....and how I can actually get one home. I spent some time this afternoon running around town. 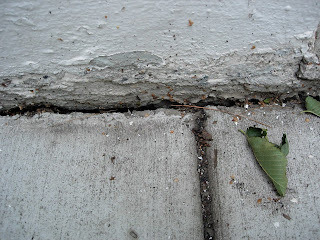 The sidewalk on the side of my house has done some inevitable settling. Where it meets the foundation, this leaves a 3/4" or so gap. 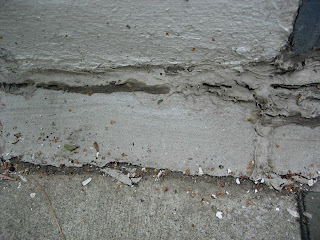 I've spent some time caulking this in past years, but am getting tired of redoing it every year. In an older section of the sidewalk, the PO put down a patch of concrete.....which is not at all flexible and really doesn't do much of anything. What I really want to do is clean it all up and put down the kind of joint filler they use on commercial sidewalks & concrete roadways. Its a thick black/gray rope of very flexible tar/fibers or flexible epoxy that you put into the joint....it is very solid but sticky enough that it grabs on to both sides of the crack....and remains flexible. If you look, you see it everywhere. However, apparently no one sell the stuff......or knows what it officially is called. I stopped by a bunch of places today.....explained what I was looking for.....was met with a whole bunch of blank stares.....or directions to the wrong product on the other side of the store. They desperately wanted to sell me backer rod. Eventually, there would be one sales person in the crowd that would all of a sudden have a light go off....emit an "aaahhhh".....tell me they knew what I was talking about....then tell me they didn't have it. It's like my mind comes up with this stuff just to send me on a scavenger hunt. Finally, an Ikea catalog arrived in my mailbox today. I laughed a little when I saw it, as I don't think they could have sent that catalog to a person that is farther from their target market. I've been to their nearby store twice and doubt that I will ever go back. I'm just not a fan. I know 97% of the free world disagrees with me on this, but I say save a few more dollars and buy the real thing. I'm going through a bit of a vintage phone phase. I just picked up this early 1950s Western Electric 500 model. I stumbled upon a local guy that restores phones and sells them at pretty reasonable prices. Can't pass that up, right? I guess two vintage phones now makes a collection. I still have my eye out for an early 1960's pastel pink phone. It's a girl thing. Waiting for this copper drip edge has become stressful. The roofing guy who came out to measure my front door overhang (for the back story see the "overhang" label below) thought that they might be ready to install the fabricated drip edge by the end of this week. So, for the past few days I have been frantically applying wood consolidator & wood epoxy to areas of the trim that need help, but will be covered by the new drip edge. I have no one to blame but myself....I should have done this while I was waiting for bids. I know, I know. Of course, we currently have 1010% humidity...and intermittent rain (just my luck that this would be the week that we get it; we've been in a severe drought all summer), so none of it is drying. Last night I was up on my ladder with a heat gun manually drying the epoxy. While I was up there, I noticed a steady little stream of wasps flying by me to a little gap in the old roofing. For fear that a wasp would appear while the copper drip edge guy was up there....and he then would refuse to work in the area.......I called a pest control guy to come out and spray for wasps. At any rate, it looks like it will be next week for the copper drip edge install. I was laying in bed Monday morning trying to will my eyes open and get my brain up to speed for starting the day, when all of a sudden my brain registered a noise. Hmmm.....what was that noise?.......sounds like someone on my roof.....yes, I think it's someone on my roof......WAIT A SEC., SOMEONE IS ON MY ROOF! I crawled out of bed and peeked out one of the windows to find a guy up on the roof intently inspecting my front door overhang. Whew.....it was the the metal fabricator/roofing guy out to measure for the copper drip edge. This was a lot sooner than I expected, as I just signed the contract and sent in my down payment last week. I threw on some clothes and went outside to chat with the guy. Bill, the roofing guy who installs the work of the metal fabricators, was very friendly and spent some time with me explaining how he intends to install the drip edge. It turns out that the drip edge they quoted runs longer on the roof than I had anticipated - this is a very good thing! There is also an area of the overhang roof that, once the alumnum came down, is pretty much a wide open hole. So, I talked to him about fixing that at the same time as the drip edge installation. I was taken by surprise when I asked how long it would take to have the drip edge ready to install and Bill said probably by the end of the week. I am a jaded, old house owner who expected this to take months. So, now the race is on for me to get the wood trim that will be covered by copper exactly the way I want it. There are some spots that I need to hit with wood consolidator.....some that I'd like to fill in with some epoxy.....and now that I know the edge will run higher up the roof, some missing trim to prime & nail up. 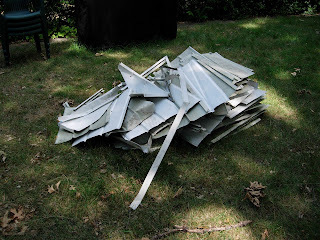 Last Friday I asked my dad if he would help me cart the aluminum trim from my house down to the scrap metal place in his mini-van. It probably took us 30 minutes to load all the pieces into the van. They seemed pretty light, but there were a lot of individual sheets. When we had it all loaded, we took a guess of how much it weighed. We decided in the ballpark of 40 pounds (my dad is usually really good at that stuff). 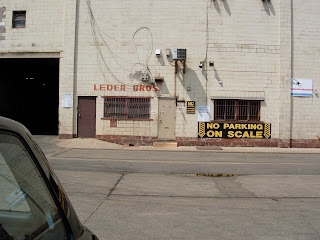 We drove down to Leder Bros. Co., the metal scrap place. The guys there were very friendly and helped us unload the stuff into a huge bin. When we were done, they called me over to show me the results on the scale. The price per pound was determined by the total number of pounds. Less than 50 pounds = $.50. 50 to 100 pounds = $.60. Over 100 pounds = $.70. 167 pounds! At $.70 a pound, that came to a cool $107. Not bad, not bad at all. Here in Minneapolis, we’ve had about two days to adjust to the collapse of the I-35W bridge into the Mississippi river. It's a bit surreal because I have only seen the situation on tv reports even though it’s only a short bike ride away. It just seems a bit unseemly to me to go down there sightseeing when a very sad recovery is still taking place. This afternoon, was the first time I drove over the Mississippi since the collapse. Not a big deal, but you certainly do noticed the bridge so much more…the size of it…..the lanes of traffic…..how high it is. Some of the jr. high aged boys in the neighborhood have been heading down on their bikes in that direction in the afternoons to check on events….you can hear them loudly discussing things on their way back home after their adventure. I’m sure this is something they will remember the rest of their lives. As we started to learn more about the 5 people that have died….and the 8 people that they fear are still missing. The thing that strikes me is how typical Minnesotan these people seem to be. People that would make good neighbors and friends. People that you would like, if you knew them. There is an unfolding story of a missing pregnant woman who was driving with her toddler daughter. If this unfolds as we fear, it is going to be very sad story. The media has covered most aspects of the collapse. The national media has now swarmed in and we have “experts” from everywhere willing to give an opinion sight unseen and facts uncollected. One of the most idiotic quotes I have heard “bridges in the US are not supposed to fall down.” Silly & arrogant all at the same time. Sigh. Bits and pieces of odd and random information have stuck with me over the past two days. Kind of small lessons learned, I guess. My cell phone service is now back to normal. As late as last night it had periods of “Emergency Only” service. Right after the collapse, the service was jammed and, of course, we were asked to stay off our cell phones (not that I ever use mine anyway). From what I have read, Verizon had sporadic service for Wed & Thurs. T-Mobile brought in temporary cell towers about an hour and a half after the collapse. The service that was available was then allocated on a priority basis to emergency workers first. This was all very interesting to me. I had always assumed that service would be pretty much available wherever…whenever. 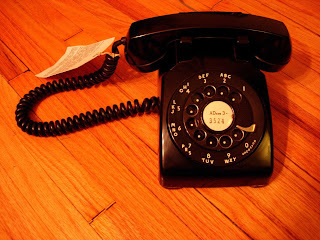 In fact, I had been contemplating dropping my home phone land line. I've changed my mind on that one. 3 minutes. That’s how long it took from the collapse to the arrival of first official emergency responders to the site. Our Governor was newly reelected last year. The Mayor (I’m not overly fond of the guy, but he has his supporters) has taken jabs at the Gov. in the recent past. The Police Chief is very new and was called into duty after a high profile chief left town under a cloud to take a new job. I don’t know much about the Fire Chief in Minneapolis. That said, I don’t think there could have been better people in place to handle this. After 9/11, I had kind of brushed off city emergency planning as a bunch of lip service. Turns out that they really do have something in place. In an very odd way, this has become somewhat of a dry run for the next terrorist attack. And finally, there really still are a lot of people that will run towards the catastrophe to help instead of away from it and that is good to know. Like every other person in the Twin Cities, I've been transfixed to the tv tonight watching the unfolding story of the collapse of the interstate I-35W bridge. I was out grilling dinner in my backyard when I started to hear the sound of sirens down by the river. When I went inside to eat, I was met with the breaking news story that the bridge had totally collapsed into the Mississippi River during rush hour. Then the phone started ringing with people checking just to make sure I wasn't by some chance down there. This bridge is a little over 2 miles from my house, and I often ride my bike down there. The bridge was a huge, steel arch truss bridge that runs just outside of downtown Minneapolis. They estimate 50+ cars were on the bridge at the time of the collapse...many of them were dropped into the river. I can't even imagine what the actual scene looks like. A couple of hours ago the city breathed a collective sigh of relief when we learned 60 kids safely escaped a school bus that news cameras had been showing teetering on the edge of the bridge. 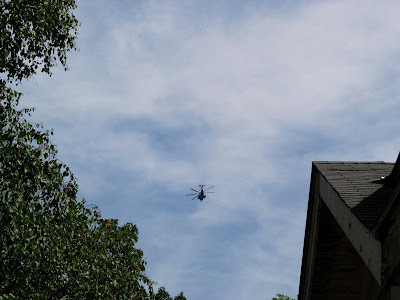 They have shut down air traffic over my neighborhood, which makes the whole thing very reminiscent of 9/11. But, they are assuring us that the chance of terrorism being involved is very slim and that this is just a structural collapse. Just a random shot of one of the reasons I bought my bungalow. My house is pretty simple, but it does have a few pretty redeeming features.